Now in its fourth year, Photo London is officially all grown up with over 100 galleries set to participate at the fair this May, with Canadian fine art photographer Edward Burtynsky announced as its Master of Photography for 2018. 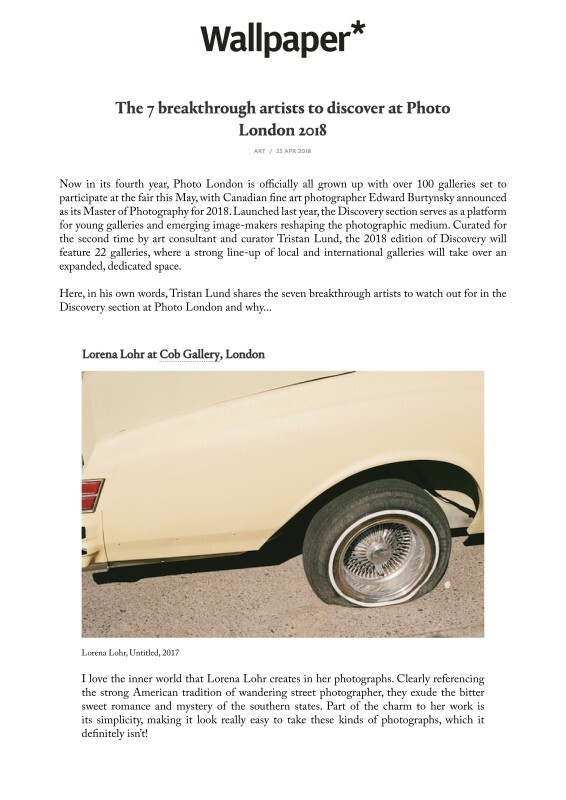 Launched last year, the Discovery section serves as a platform for young galleries and emerging image-makers reshaping the photographic medium. Curated for the second time by art consultant and curator Tristan Lund, the 2018 edition of Discovery will feature 22 galleries, where a strong line-up of local and international galleries will take over an expanded, dedicated space. I love the inner world that Lorena Lohr creates in her photographs. Clearly referencing the strong American tradition of wandering street photographer, they exude the bitter sweet romance and mystery of the southern states. Part of the charm to her work is its simplicity, making it look really easy to take these kinds of photographs, which it definitely isn’t!